I’ve been doing a lot of thinking lately and that’s when I usually get in trouble, but I’ve forged on regardless. This time my thoughts have turned to adapting our behavior to fit our horses’ individual characteristics. If we are to be better horsemen, making our horse’s welfare the top priority, then it’s possible we may have to adjust our behavior and not necessarily the horses.’ I don’t think it’s possible to change the horse’s intrinsic nature, but I do think we can adapt our personalities to complement and embrace their natural behavior patterns. I’m not advocating Natural Horsemanship because in my opinion that particular label is an oxymoron simply because there is nothing natural occurring between horses and humans. They are the prey and we are the predators. The goal is to get them to trust us enough so we can work together and form a partnership that is good for both of us. In other words, we need to almost become therapists for our horses. Assessing their personalities, temperaments and behaviors, then figuring out what they need and acting on it. For example, if you have only one horse to deal with you may already have an insight into what he or she needs and how to achieve it to make yours a lasting productive relationship. However, if there is more than one horse in your life it may take many twists and turns in order to distinguish all the diverse traits that create the uniqueness of a particular horse and the best way in which to approach that individual horse. Nervous personalities in humans may click better with a ‘steady eddie’ and on the flip side if you are calm and unflappable you may be the perfect type for a horse who needs quiet direction. 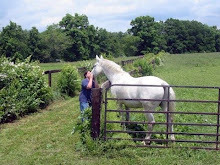 This is what I mean by adapting our behaviors to enhance our relationship with our horses. Working with many horses over the years it has become apparent that each horse is an individual with different needs that should to be addressed on an individual basis. The basics are the basics but some horses need special treatment to help them get through their lives happy and comfortable with themselves. 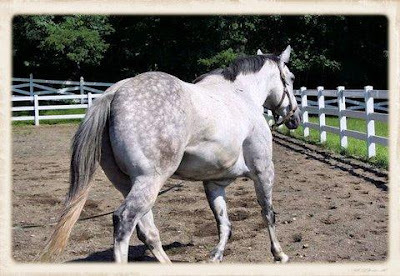 The question is what type of horse do you have and is your personality in tune with what your horse needs. Compatibility is a key ingredient to a healthy relationship. Are you compatible with your horse? And if not how are you dealing with the differences in your temperaments; are you adapting to your horse or trying to work with your horse to make him adapt to you? Below are just a few examples of some of our herd’s distinctive behaviors. Each one is different but, when worked with correctly, they shine like the stars they are. Mellon is a very sensitive and nervous type of horse. If he were human I’d say he has a Type A personality. He lives a very stressful life all due to his sensitive nature and a history of distrust and abuse when he was very young. He can’t change himself so my daughter had to adapt to his behavior. When working with him - and it’s been years - she is always the calming force in his life. Nate is very sweet but also quite lazy to the point of stubbornness and there is no changing his natural instincts. So, my daughter again had to adapt her behavior to his training. The gentle, patient-calming approach taken with Mellon wouldn’t work for Nate. She had to train him with a slightly more energetic and assertive tone. Donnie is a nervous type who has difficulty trusting and doesn’t like sudden movements or changes in his environment, so he can’t be rushed or pushed too hard, but at the same time, working too cautiously around him makes him more suspicious, so he needs someone to be calm and reassuring, but also confident enough to be firm but fair and take charge when he panics. Dusty is totally different from any horse I’ve ever ridden. She’s enthusiastic, adventurous, interested in learning new things and tries hard to get it right. So she and I are very compatible because we basically have the same personalities. Blue is very laid back, even lazy, and needs to be motivated in order to work productively. Being calm and laid back as a rider doesn’t necessarily work with him either. He reminds me of my Erik who had the same basic laziness. Where Blue is not a spooky type, I ride him differently than I did Erik who spooked at many things. Erik needed a combination of sympathy and firmness to get him through his worries. I had to adapt my riding to work with each of these horses too. These are just a few examples of the different nature of horses that needed different adaptations to their personal quirks. It got me thinking that, maybe what makes a good rider, and a good horseperson in general, isn’t so much about talent or technique or even level of training. Maybe it’s something as basic as the ability to understand what each individual horse needs us to be and adapting our own behavior to that when working with them. Too many training methods focus solely on modifying the behavior of the horse to suit our needs, some to the point of removing all personality from the horse and making it little more than a machine to do our bidding. Seldom does a training method take into consideration the handler/rider’s ability to adapt to the horse. To the extent that we are able to adjust our behavior, why shouldn’t we? Maybe this is at the heart of what it means to be a good horseman.